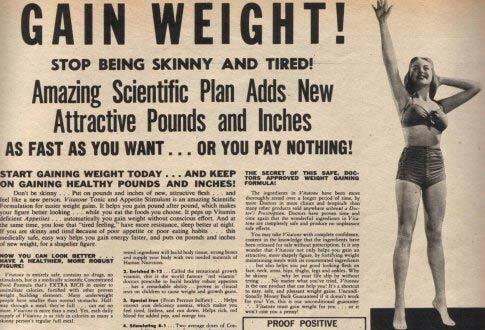 People Used To Be Willing To Pay Good Money To Gain Weight… Seriously. 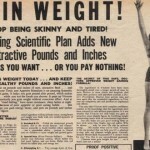 You are here: Home / Weight Loss / People Used To Be Willing To Pay Good Money To Gain Weight… Seriously. 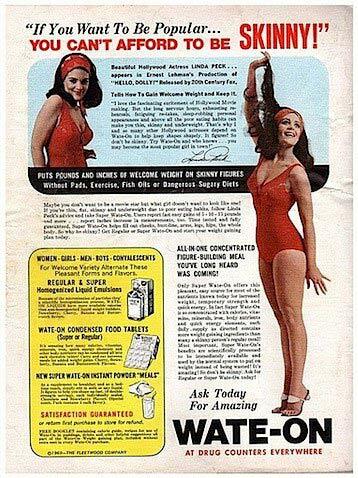 Living in the culture that we do today where everyone is so concerned about appearance, about being skinny, and where billions of dollars are made by companies helping people to lose weight every year, these ads that I saw today from some vintage magazines seem very foreign. 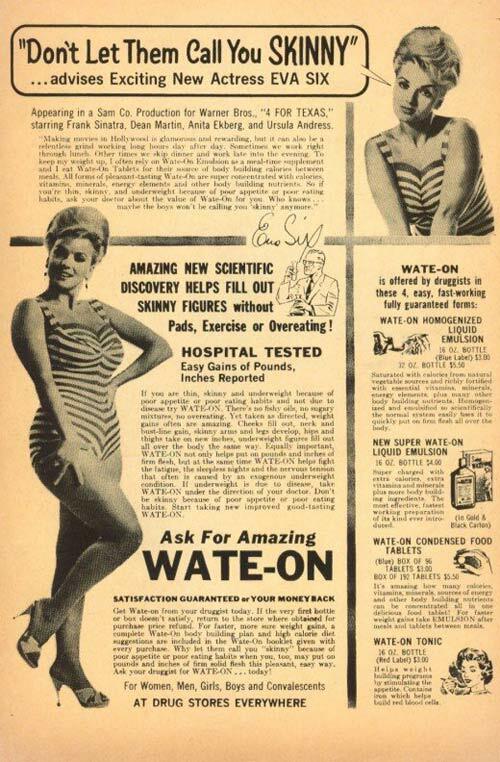 Wate-On: Don’t let them call you skinny! Numal: Skinny girls are not glamour girls! 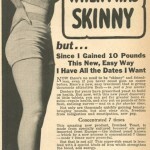 Kelp-A-Malt: I wonder how she did it… she was skinnier than I am! 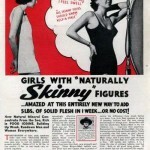 Wate-On (again): If you want to be popular… you can’t afford to be skinny! 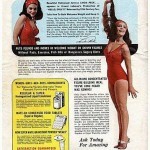 Unknown product: Gain Weight! Stop being skinny and tired! Here’s a look at a few of the ads, click the images in the gallery below to view full size. 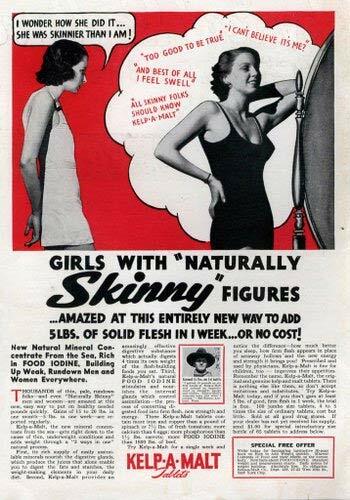 Granted, the ads come from a different era in the 50s and 60s when a “curvy figure” was en vogue and obesity wasn’t the epidemic it is today, but seeing these ads made me realize just how much things have changed. 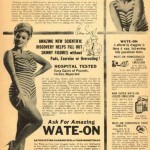 There is no way we would see these ads today. To be quite honest, however, it’s not like the women in the photos post “weight gain” are overweight by any means, just that they’re not stick thin. In some respects I think that’s a good thing. 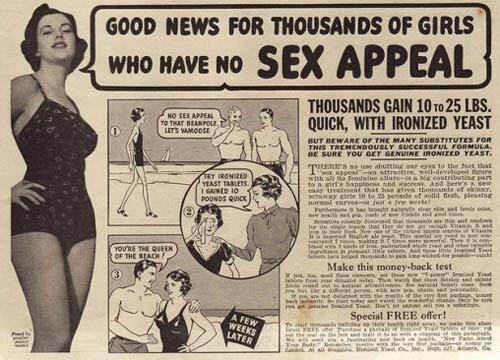 What are your thoughts about these vintage weight gain ads? The people selling weight gain products AND weight loss products are two sides of the same coin. They’re in it for the MONEY. Worse than that, their primary marketing technique is to erode the self-esteem of their potential customers. Next Post: I’m Thinking About Giving The P90X Fitness And Nutrition Program A Try. Have You Tried It?